If you've read my blog for any amount of time you know that I love soup. I'm not one of those soup lovers that only enjoy soup in the fall and winter, I absolutely love soup year round. However, it wasn't always that way. Growing up my mom's idea of soup came from a can and was almost always condensed chicken noodle. Don't get me wrong there is something comforting about canned chicken noodle soup, but it pales in comparison to homemade. When I moved out on my own in college I ate a lot of soup, and I mean a lot. My favorites were cream of asparagus and cream of broccoli. Soup was cheap and I had very little money after paying my tuition, rent, and household expenses. I think I probably ate soup at least twice a week for four years. After meeting my husband in graduate school I still ate a lot of canned soup. This didn't change until approximately six years ago when my oldest was born. I decided that I needed to start cooking from scratch after my mother passed away from cancer nine days after my son was born. Given that my grandmother also passed away from cancer I decided to take my future into my own hands and completely change my diet. I basically taught myself to cook through cookbooks, the internet and the knowledge that my mom had given me growing up. And I feel in love with soup. Over the last six years I have made a large amount of homemade soup and gotten very adept at it. As I was looking through the April issue of the Food Network Magazine I came across a recipe for Matzo Ball Soup, which looked delicious and full of fresh herbs and flavor. 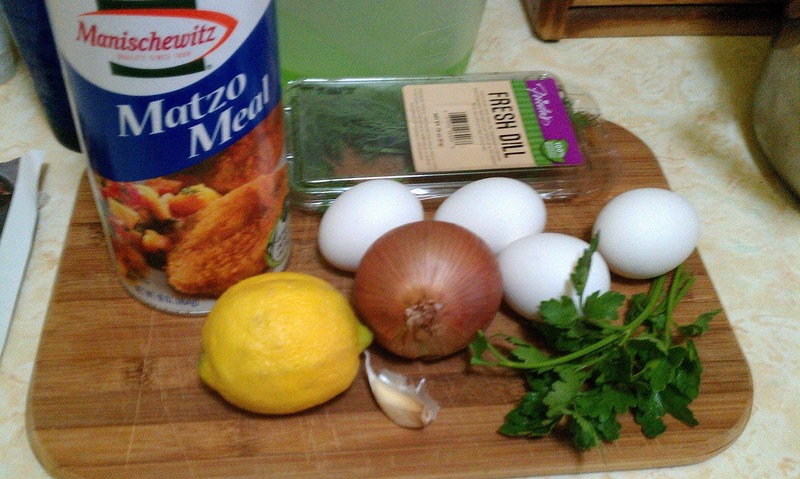 This recipe has 11 ingredients in the broth and 9 in the matzo balls. It takes 4 hours and 20 minutes of total time, 35 minutes of which is active and makes 6 servings. I had no problems finding any of the ingredients at my local grocery store. I did forget to buy coriander seeds, so I left them out of the broth completely. I would suggest making the broth the night before. I let my broth cool in the fridge for 3 hours and while a large amount of fat congealed on the surface there was still a large amount that could still use the extra cooling time and another skim. 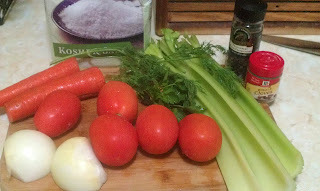 Additionally, I would recommend straining the broth to further reduce the fat. I followed the remainder of the recipe as written. My two boys loved this soup, so much so that my oldest son drank all of it out of his bowl and then moved onto his younger brothers. I thought the flavor of the broth was delicious. It had a more distinct flavor than regular chicken broth and made a great base for the matzo balls. The matzo balls themselves needed a little more salt, but other than that were delicious. I liked the addition of the ginger and onion, it really made the taste more distinct. Overall, a flavorful soup recipe that makes lots of delicious leftovers! For the recipe go to Matzo Ball Soup. YUM! I love Matzo ball soup! :) Thanks for sharing the recipe! I do too, this recipe was yummy! Never heard of this one, but sounds much better than what I have been eating lately! I will give this one a try. It really is tasty and makes a bunch of leftovers for anther meal! We also love soup anytime of year! Your pictures look fantastic and it sounds amazing. I must try this soon. Thanks :) If you end up trying it, tell me what you think! Soup is great in the winter, I make it very frequently when the weather gets cold! Especially with a great loaf of bread!